The key to making Provel palatable is moderation. (In the sense that this summer St. Louis received a moderate amount of rain.) The key to making Provel palatable and enjoyable is to employ it only as an accent for other, better ingredients. 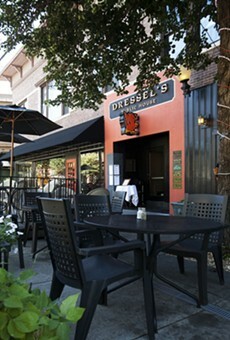 The key to making Provel not merely palatable and enjoyable but a cause for celebration is to visit Dressel's. Among the many wonders that chef Michael Miller has accomplished in remaking the menu at this Central West End stalwart is to showcase Provel — an appropriately moderate amount, mind you — in the "Porchetta Louie" sandwich, one of his signature dishes. In this high-low riff on a Philly cheesesteak, the Provel's tang works with bitter rapini and spicy pepperoncini to contrast and elevate the sandwich's tender slices of herb-roasted pork, and its molten gooiness helps hold the ingredients in place inside a toasted baguette. It's enough to make you question why you'd ever waste such a useful foodstuff on a cracker-thin crust.